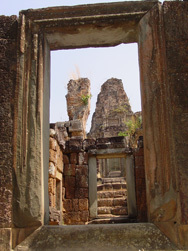 East Mebon is a large temple-mountain-like ruin, rising three levels and crowned by five towers. 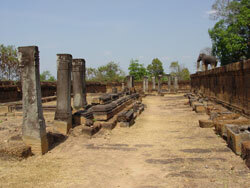 Jayavarman IV, a usurper to the throne, moved the capital from Angkor to Koh Ker in 928AD. 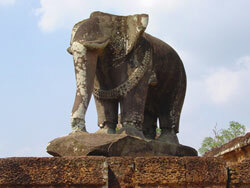 Sixteen years later Rajendravarman II returned the capital to Angkor and shortly thereafter constructed East Mebon on an island in the middle of the now dry Eastern Baray. The temple is dedicated to Shiva in honor of the king’s parents. 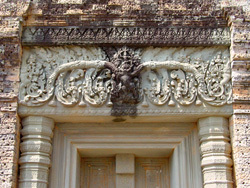 Inscriptions indicate that it was also built to help reestablish the continuity of kingship at Angkor in light of the interruption that occurred when the seat of power had been moved to Koh Ker. 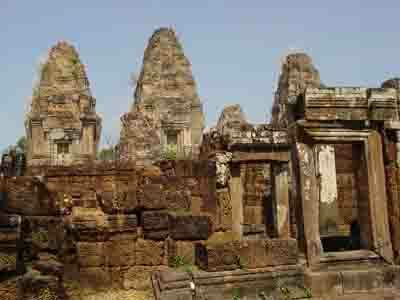 There seems to be some scholarly debate as to whether East Mebon should be categorized as a temple-mountain. 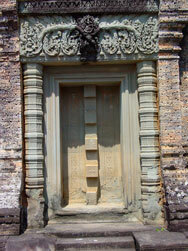 Inscriptions record activity at the temple as early as 947AD, but East Mebon was not consecrated until 952AD.